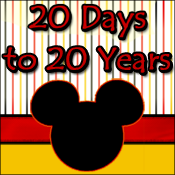 Disney Goddess: Be Crabby on February 6- I Dare You! Be Crabby on February 6- I Dare You! You know how certain Disney movies mean more to you than others? We all have ones that just strike a chord! For me, Mulan holds a whole buckets worth of sentiment. I can’t even catch a glimpse of that movie without a flood of memories and emotions. Which is exactly what happened to me this morning. There I was, in the car after just dropping off my daughter at school. Late. I was feeling stressed. A conversation I had had with my husband earlier in that morning was still swirling around in my head rather uncomfortably. I was crabby. There you have it. Then the moment came that put it all into perspective for me: “Today is February 6,” said the voice over Radio Disney. Taken aback, I recalled another February 6, some years ago that was …oh, just a bit more traumatic. Funny how things can sharply shoot back into focus. Let me back up a few days to February 2. Well, a few days and a few years actually. It was 1999. Mulan had just come out on video and I snuggled on the couch with my two-year-old daughter for a much-needed “prego mom with a toddler” rest. Or at least that’s what I thought I was doing! It was during this time that the phone rang. Who knew that something so mundane as answering the phone could change my life? Fast forward to February 6 and I was headed into surgery. At 21 weeks pregnant I was much more worried that my unborn child would have a worse time with this operation than me. 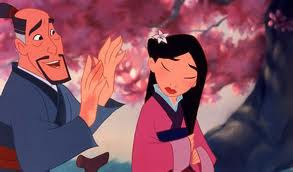 I dozed off in an anesthetic slumber with the Mulan line, “The flower that blooms in adversity is the most rare and beautiful of all” on repetitive prayer in my mind. Yeah, that February 6 was a bit more burdensome than a daughter who’s late for school and a disagreement in the kitchen. Lord willing, we both pulled through just fine. I’m still cancer free and my daughter nearly made it to full term, with no lasting ill effects. We’re a little kooky, but I’m not entirely sure I can blame that on February 6th events. Mulan, in the comfortable cocoon of her childhood home, bravely embraced a new life’s perspective to save her father, dangerous as it was. It could be argued that my daughter did essentially the same to save me. Even 13 years later, I am still learning that adversity- whether in the form of a life-threatening event or a just plain crabby day- can provide the most beautiful blooms. Sometimes all it takes is a little change in perspective.